False ceiling as the name suggests is the secondary ceiling below the main structural ceiling of a room. Since it is attached with the primary structural ceiling, it is also known as suspended ceiling or drop ceiling. Initially it was used in commercial spaces like offices, but today false ceiling is also used in residential projects. If you are planning to get false ceiling done at your home and you are not quite sure about the process and how much does the false ceiling costs then continue reading. False ceiling is usually done with two kinds of materials i.e. Plaster of Paris (POP) or using Gypsum boards. First of all it gives you additional insulation from heat. Reduces overall height of the space and that’s good for air-conditioning. Helps in hiding electrical wire, ducts, frames etc. 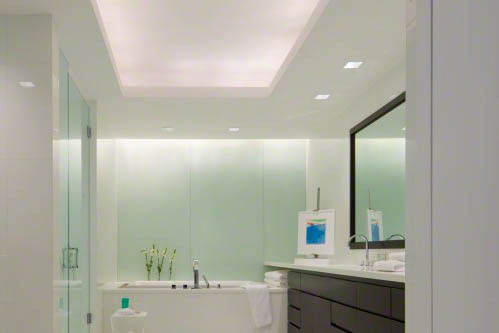 False ceilings with proper lightings can do aesthetic wonders. But I believe that false ceiling are good and it can help you create aesthetic look and feel. So how much does it cost to get a false ceiling for a room/home? False ceiling costs are very reasonable. POP false ceiling rates starts from Rs. 60 per square feet and may go up to Rs. 95 or even more in some cases. POP False ceiling with complex design may cost around Rs. 120 to Rs. 125 per square feet. There are various types of designs available and when you go for straight forward plane design, it would cost less than a complex design. But usually that’s what the cost is and it includes everything including labor charges, materials and angles etc which is needed for suspension. Apart from that, there are some branded materials from globally renowned companies like Saint-Gobain. So what’s the best way to get false ceilings done at your home or your workplace? Well, there are many ways and to begin with if you are planning to get interior designing done, then the interior contractor you are working with will be able to help you out with the false ceiling as well. Or else, you can independently find false ceiling contractors. There are many contractors who work under various interior contractors as a subcontractor for false ceiling works. They will be happy to work directly, but just be double sure to check everything before engaging with a false ceiling contractor. The process starts with a free survey of the premises. Based on the area and layout, your contractor should be able to suggest you a few design options to choose from. If you have something in kind, you may show them the pictures; sketches etc and get customized quotation based on your own false ceiling design. Once you have finalized a design, you can choose the material (POP or Gypsum) and then figure out the overall cost for the false ceilings. Usually the false ceiling contractors would ask for some advance payment and that’s okay. If you are working directly with a false ceiling contractor, make sure to agree on a progress based payment term i.e. you will release payments in two or three phases based on the progress of the work. This is to ensure you don’t have to keep looking for the contractor while the work is still not completed. Next Next post: How Much Does Pest Control for Bed Bugs Cost in India?